This week we will all experience the Winter Solstice, the moment that the amount of available Sun light has reached its lowest amount each day. From the 21st of December on the amount of day-light will start to slowly increase again, you could say that this moment marks the tree new year in the solar calendar ! The solstice may have been a special moment of the annual cycle for some cultures even during neolithic times. Astronomical events were often used to guide activities such as the mating of animals, the sowing of crops and the monitoring of winter reserves of food. Many cultural mythologies and traditions are derived from this. This is attested by physical remains in the layouts of late Neolithic and Bronze Age archaeological sites, such as Stonehenge in England and Newgrange in Ireland. I want to mark this week by sharing some of the great Pagan monuments and sites I have visited both in the UK and here in Ireland, To the Pagan people of the past this week was a very special one, it marked the moment of new birth. It is for moments like these that Pagan people assembled their standing stones and stone circles. 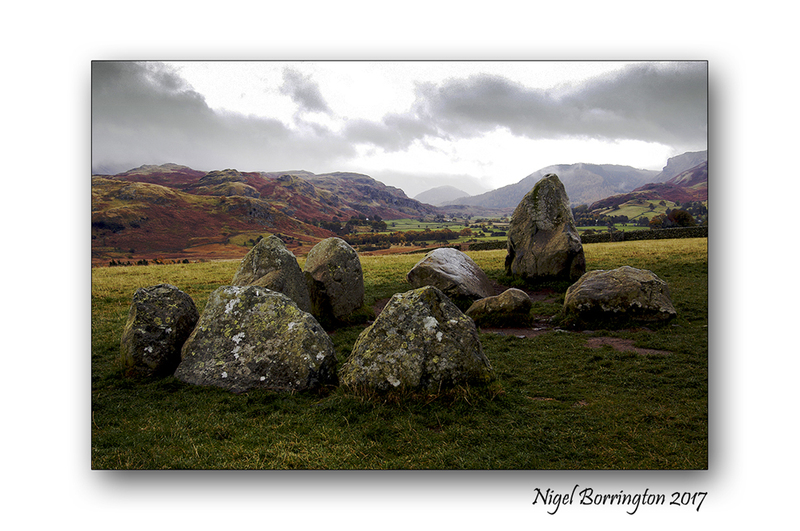 Today I have posted and image of (Castlerigg stone circle,Keswick in Cumbria, North West England), this stone circle is one of the best preserved in Europe and located just north of the lake district, you can seen many of Cumbria’s great mountains in the background. This stone circle would not only have been used to record the moments of the Winter Solstice but likely all the the events both in the (Sun’s the Moon’s and the stars) calendar of movements. The stones are of a local metamorphic slate, set in a flattened circle, measuring 32.6 m (107 ft) at its widest and 29.5 m (97 ft) at its narrowest. The heaviest stone has been estimated to weigh around 16 tons and the tallest stone measures approximately 2.3m high. There is a 3.3m wide gap in its northern edge, which may have been an entrance. Within the circle, abutting its eastern quadrant, is a roughly rectangular setting of a further 10 stones. The circle was probably constructed around 3200 BC (Late Neolithic/Early Bronze-Age), making it one of the earliest stone circles in Britain and possibly in Europe. It is important to archaeoastronomers who have noted that the sunrise during the Autumn equinox appears over the top of Threlkeld Knott, a hill 3.5 km to the east. Some stones in the circle have been aligned with the midwinter sunrise and various lunar positions. There is a tradition that it is impossible to count the number of stones within Castlerigg; every attempt will result in a different answer. This tradition, however, may not be far from the truth. Due to erosion of the soil around the stones, caused by the large number of visitors to the monument, several smaller stones have ‘appeared’ next to some of the larger stones. Because these stones are so small, they are likely to have been packing stones used to support the larger stones when the circle was constructed and would originally have been buried. Differences in opinion as to the exact number of stones within Castlerigg are usually down to whether the observer counts these small packing stones, or not; some count 38 and others, 42. The ‘official’ number of stones, as represented on the National Trust information board at the monument, is 40. In the early 20th century, a single outlying stone was erected by a farmer approximately 90m to the south west of Castlerigg. This stone has many linear ‘scars’ along its side from being repeatedly struck by a plough, suggesting that it was once buried below the surface and also why the farmer dug it up. It is not possible to say whether this stone was originally part of the circle, or just a naturally deposited boulder.